Get 33% off the list price of any one item at Borders, with the normal exclusions, through Thursday, Aug. 5, 2010. 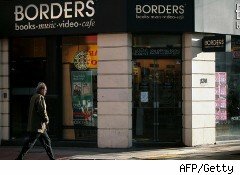 Print this Borders coupon to get the discount. On line, use coupon code BFN8099Y, which expires at 11:59 p.m. Aug. 5. One coupon use per person. You can also use these Borders coupons at Waldenbooks and Borders Express. You've gotta be a Borders Rewards member to use these coupons. Fortunately, joining is free and only takes about two minutes, in stores or online. On the Borders site there's a link to a vacation sweepstakes in connection with the book-turned-movie, Eat, Pray, Love. Win a three-week trip to Italy, India and Bali that mirrors the journey taken by the book's protagonist, Liz. The movie stars Julia Roberts. I loved the book, but the trailer looks...eh. Caveats: cannot be combined with any other offer, promotion, sale pricing, coupon, or discount, including group discounts. Excludes previous purchases, special orders, shipping, gift cards, coupon books, newspapers, magazines, comics, audiobook downloads, music downloads, vinyl LPs, Rosetta Stone® software, tax software, video games, CDs in California stores, all electronics, including e-readers, and certain e-books.